This was a rare session with the master herself, the composer of so many staples of ICE’s concert repertoire, to prepare for two "Morning Meditation" sessions this week at the Ojai Festival in California, structured around Pauline’s music. Founder and Director of the Deep Listening Institute, Pauline’s work has informed ICE’s programming and the group dynamic of ICE’s entire history. Pauline couldn't join us for the trip out west, but we are all here now in Ojai, soaking up this magically scented town, and becoming aware of its energy as we did last Saturday at the Abrons Underground. Back to that meditation at Abrons: as we all sat there, each of us heard the building’s quiet ventilation system, but each of us, it became clear later, heard something different in it; as I listened closely, I was aware of a central pitch, but also a spectrum of pitches around it. This in turn was in dialogue with a soft hum of overhead lights, and shifts and creaks from the participants. Listening for a character in every sound I perceived, I was truly able to hear a subtle interaction between the objects in our environment. The first piece that we practiced built on this experience: called Environmental Dialogue, we used our instruments and voices to pick up on sounds that we heard, and to continue those sounds, approximating their pitch and general affect. This achieved what Pauline had in mind, namely a subtle amplification of our atmosphere, using our powers of listening and musicianship to magnify everything sounding around us. Next was The Well and the Gentle, another classic Oliveros piece, which was featured in our very first concerts at the Abrons Arts Center. Each performer draws from a “well” of concentration for inspiration to action. Using a fixed set of available pitches, the players choose from gestures that one associates with any kind of performance—accompanying, merging, soaring above, matching sound, supporting an idea or texture—with the option also of just listening. It was wonderful to have to the opportunity to ask Pauline about this piece, after many ICE performances and teaching workshops with student groups, to learn how we can perform the work most sensitively. Many times, she told us, “Don’t be timid!” While we were all aware of the overall atmosphere that we were creating, no one wanted to rock the boat, and Pauline gave us license to be daring and use the maximum dynamic range. “It’s okay to add some drone notes,” she also said of the second part of the piece, which is more rhythmic; we worked to find just the right tempo so that one could perceive waves of rhythmic counterpoint moving across the group. One thing that is especially difficult to explain to students about Pauline’s pieces, and pieces that involve improvisation generally, is how they end. How do we know when the piece is over? The answer, always, is that one just knows—by intuitively feeling the closure of a piece’s structure, and knowing when everyone has contributed something essential. Remarkably, ICE never has a problem with this—but each performance setting is necessarily different, and we can’t force an ending on a piece that wants to keep spinning out. More complicated pieces were discussed, in detail: Out of the Dark, a process piece centering around one pitch—a concert D. The players slide to specified pitches above and below the D, explore its overtone spectrum, and time their gestures to a partner positioned across the performing circle. 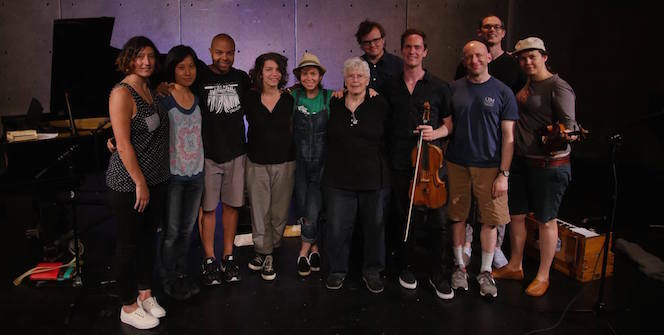 It’s a challenging one, and Carla Kihlstedt, another amazing improviser and composer, had many questions about when to move from one part of the piece to the next. Pauline not only knew her own piece intimately but was able to discern when we performed it exactly when one part of the group moved between sections—no small feat of listening. A key moment in the rehearsal was when the players practiced making single sounds with our instruments, separated by silences, that were completely unlike each other in every way. It took a couple of tries, but we got better; it was a real challenge to not imitate our colleagues, and to contribute best, by actually acting against our instincts as chamber musicians. In The Witness, another complicated piece in multiple stages, each player moves from an egocentric focus to a more empathic performing mode: first playing original gestures, ignoring the group; then continuing a sound heard around us; and then merging with the gestures we heard, dissolving the sense of self. This third state, called The Witness, Pauline explained, was “a special state of consciousness,” empowering one to listen and contribute in equal measure, feeling oneness with the whole of the group. The question arose in this challenging work: within any “rules” of performance and any restrictions, how can one add to to the experience most fully, and most originally, by listening deeply and therefore giving the best of oneself? In the space of a few hours, Pauline started to show us how. All of us felt how lucky we were to give witness to the spiritual teaching of our trusted musical guardian and closest of friends.